01 - Poly Single Color Long Lines 1/4"
02 - Poly Single Color Long Lines 3/8"
3/8 in. woven polyester long lines. Woven hollow-core polyester long lines and check cords. Available in assortment of colors. 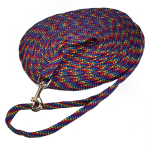 Great for obedience training, tracking and hunt training. With a specific gravity of 0.9, these lines float! made with nickle plated 3/8 inch (small) snap. 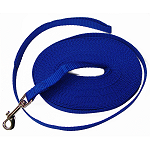 03 - Poly Single Color Long Lines 5/8"
04 - Nylon Single Color Long Lines 3/8"
05 -Nylon Single Color Long Lines 5/8"
06 - Nylon Single Color Long Lines 3/4"
07 - Nylon Single Color Long Lines 1"
This two color lead was developed for the Canine Good Citizen® (CGC) Program, CGC Evaluators and CGC Classes. 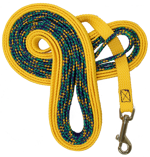 The lead is 20 feet in length and the first 10 feet is Gold and the second 10 feet is Royal Blue. 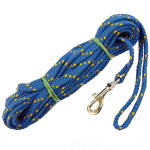 The lead may be used in all CGC exercises requiring a 20 foot lead but is most useful in exercisies requiring the handler to be 10 feet from the dog. The color separation on the lead marks the proper distance and is easy for the handler and evaluator to see and stand at the proper distance. As seen and described in the AKC CGC Evaluator's Newsletter. This is a must have product for all CGC Evaluators.